Britain’s Andy Murray hits a return against Milos Raonic at the O2 Arena yesterday. 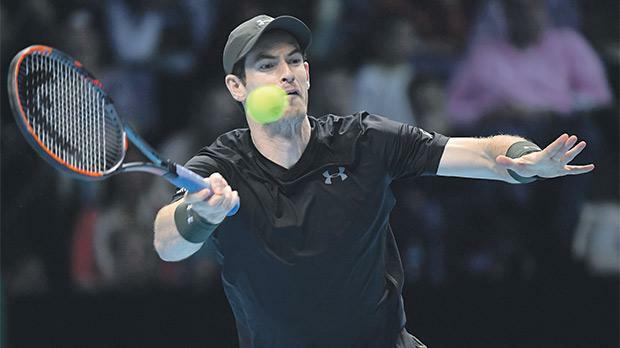 Outplayed at times and running on empty, Andy Murray survived another marathon match to beat Milos Raonic 5-7 7-6(5) 7-6(9) in a semi-final thriller at the ATP World Tour Finals yesterday. Murray faces Novak Djokovic in today’s final with the title and the end-of-season world number one ranking on the line. Last night, Djokovic thrashed Japan’s Kei Nishikori 6-1 6-1. Big-serving Raonic had a match point in the final exchanges of a spellbinding three-hour 38-minute battle of wills but like world number one Murray’s last 23 opponents found the Briton an impossible riddle to solve. Murray looked out on his feet at times but clawed his way to record his 77th win of a remarkable year. An incredible duel was on a knife edge at 127 points apiece going into the final set tiebreak after Murray was broken at 5-4 and 6-5. In front of 17,000 spectators creating a fever-pitch atmosphere at the O2 Arena Canadian Raonic saved three match points in the breaker before succumbing. “Unbelievably tough match,” said Murray, who spent a then tournament record three hours 20 minutes beating Nishikori in ground play on Wednesday. Murray’s hold on the top spot he wrestled off Djokovic this month seemed to be loosening when an inspired Raonic took the opening set and broke early in the second. There was no hint of the problems to come for Murray when he breezed through his opening two service games to love. But Raonic, showing lovely variety to compliment his easy power, earned a break point in the fifth game and three more at 4-4 when a ragged Murray was given a time violation warning by the umpire. If those missed chances were playing on the Canadian’s mind it did not show. He pounced at 5-5 when Murray’s forehand went AWOL before the Scot double-faulted to drop serve. Raonic calmly clinched the opener and when Murray topped a dismal forehand halfway up the net to drop serve in the third game of the second set he slumped heavily into his chair. When play resumed it was Raonic who faltered for the only time in the match as Murray reeled off eight consecutive points. Raonic, carrying the mental scars of five defeats by Murray this year, notably in the Wimbledon final, was soon hammering away again and pressed hard near the end of the second set. Murray hung in and led 5-3 in the tiebreaker. Raonic got back to 5-5 before an angled volley gave Murray a set point he converted when Raonic returned a forehand long. Murray had to play stunning tennis to keep with the relentless Raonic in the decider before breaking to love at 4-4. The plot was just thickening though. Raonic broke, Murray broke, then Raonic broke again to send the match to a breaker. Raonic saved match point at 5-6 with a blistering forehand and Murray wasted his next with a backhand long. An ace brought up a third chance for Murray but Raonic survived with a volley. Raonic’s moment came at 9-8 but Murray snuffed out the danger with a volley. A swinging wide serve gave Murray a fourth match point and Raonic finally netted to end the contest.